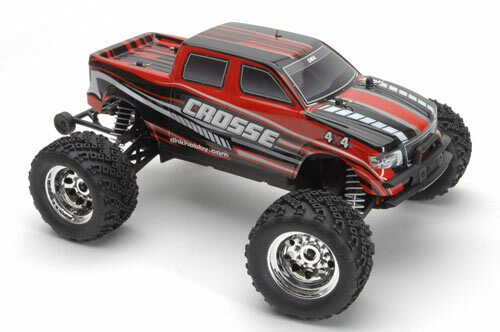 The Crosse offers 4WD stomping truck performance at a price which will appeal to everyone! 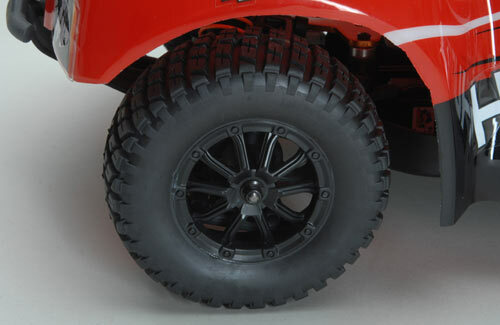 Newly designed chrome plated wheels mated to soft compound tyres enhance the appearance and provide superb levels of off-road grip. 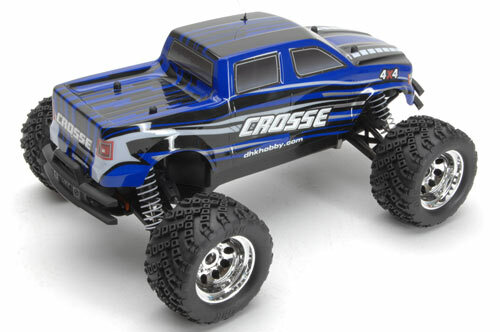 A chassis cover completes the all-terrain package helping to keep water and dust out! 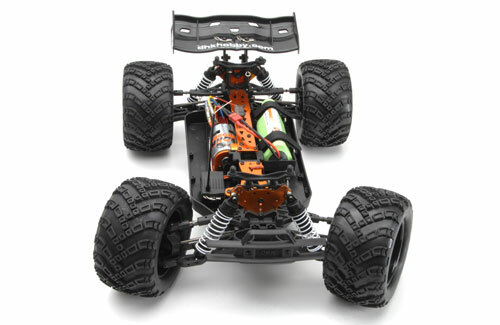 • Aluminum shock towers with threaded, oil-filled shocks! 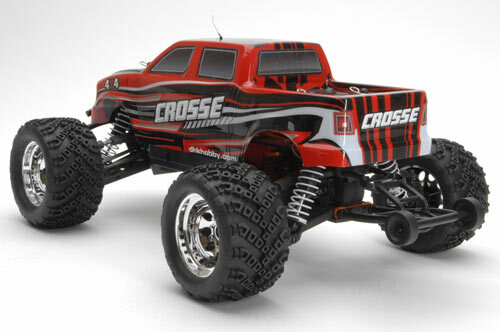 If you're looking for a large, 4 Wheel Drive Monster Truck with seriously high power - then look no further than the DHK Crosse Brushless. 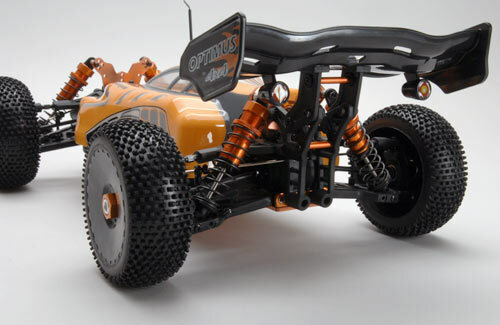 So powerful it comes with a wheelie bar as standard to prevent unwated flips, the brushless motor really does pack some punch. 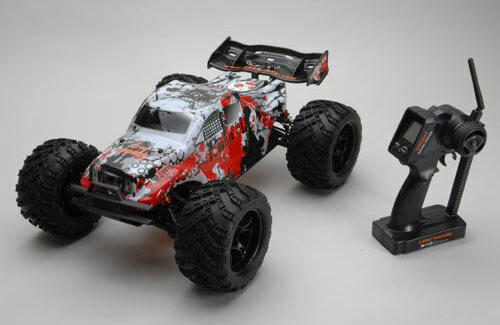 Supplied RTR with 750 class brushless motor, servo, receiver and ESC all pre installed, all you have to do is charge the battery with the supplied charger, install batteries into the supplied transmitter and you're ready to run. 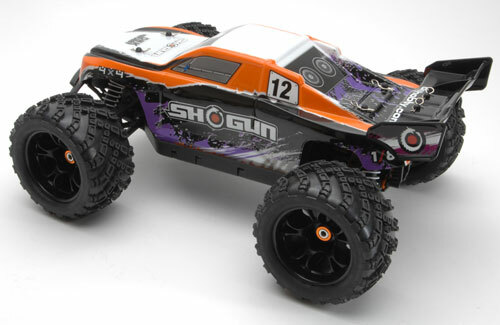 The Brushless motor provides enough power to race across any terrain without issue, you won't be left in the dust. cars. DHK have spent time simplifying the design and optimising the specification without sacrificing the exciting performance you would expect from a DHK car. 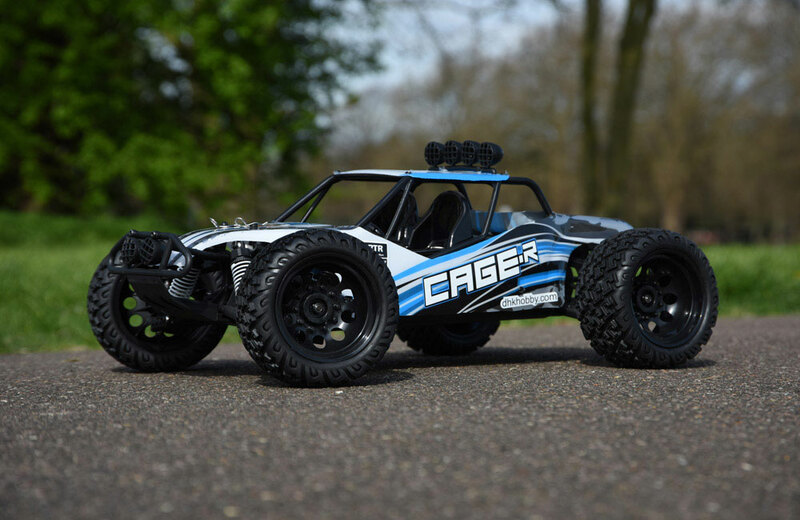 The CAGE-R chassis and steering geometry is designed to suit 2WD and provide you the driver with the correct 'feel'. Needless to say, DHK have still lavished this car with a variety of design features that you would normally see on higher level cars. 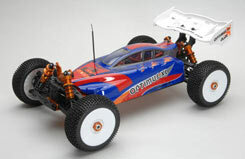 All of the wheels and the drive train are fully ballraced. The durable plastic chassis is enhanced by a full length upper spine to prevent central flex. 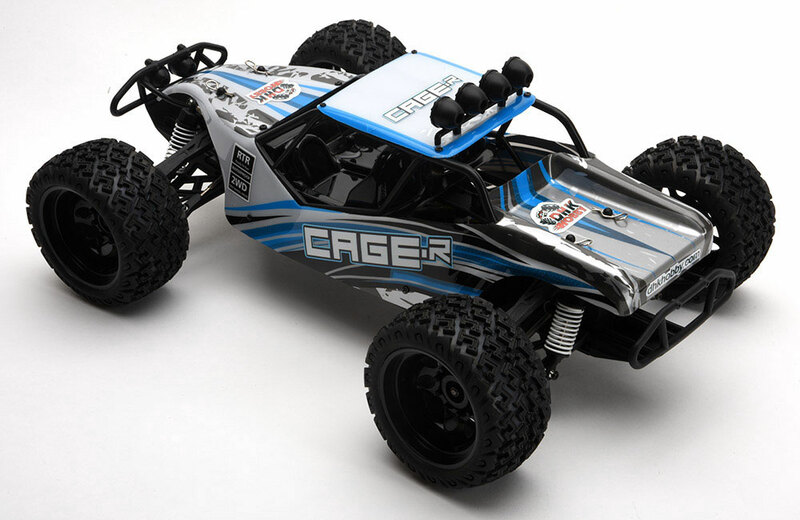 The rear differential, output cups and drive shafts are fully metal for maximum durability and the powerful brushed motor incorporates an internal cooling fan. 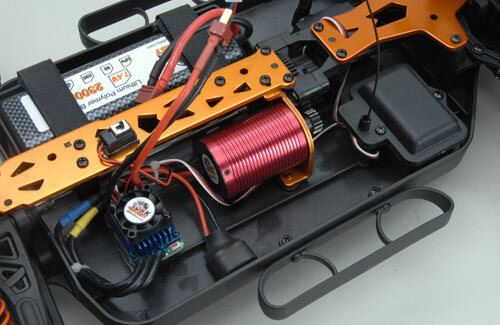 The supplied ESC is capable of using the 6 cell NiMh (supplied) or 2S LiPo batteries. 6Kg servo and a useful 'servo saver' device to absorb shocks. 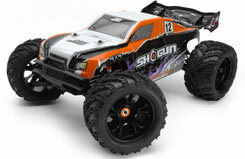 Short Course Trucks are now one of the most popular new classes in both full size and RC racing. 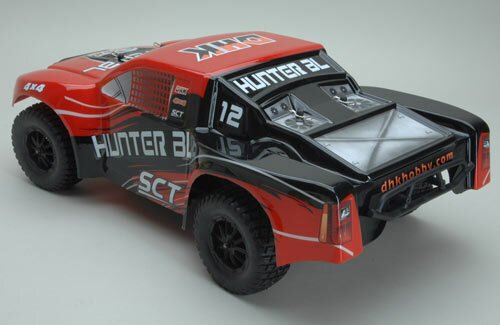 The DHK Hunter is a high-performance short course truck that offers a great combination of technology and fun along with stunning value. 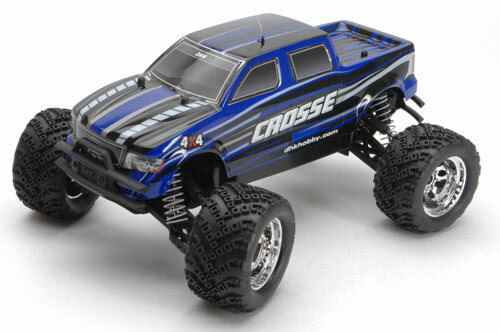 The Hunter is a rugged 4WD truck and is ready for whatever challenges you throw at it and is comfortable on terrain such as dirt and pavement. A step up from brushed motors, brushless motors really pack a punch and has become the standard on all high performance electric uses. Along with offering much more power they are more efficient so this power doesn't come at a high cost to duration. 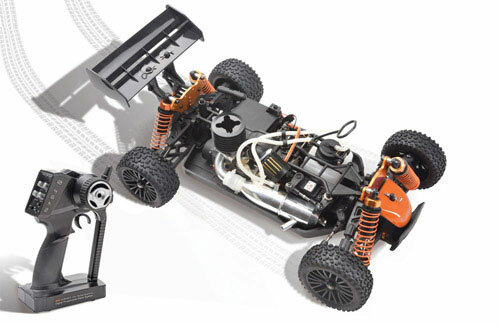 This brushless Hunter uses a 3970kv brushless motor, 55A brushless ESC and a 2S Li-Po battery. Li-Po batteries hold higher voltages throughout usage giving you even more power and their light weight and high charge density also increase duration over a NiMh. 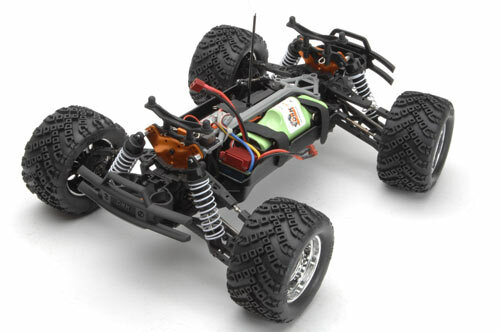 Brushless motors and Li-Po batteries are the only way to go if you want performance! The Hunter's versatility and toughness all come from its strong design. Utilizing an ultra-stiff double-deck chassis and combining that with a mid-motor design gives amazing balance, responsive steering and rugged suspension performance that will impress beginners to the most seasoned racer. With four wheel drive traction, the Hunter transfers some incredible power and torque to the ground. 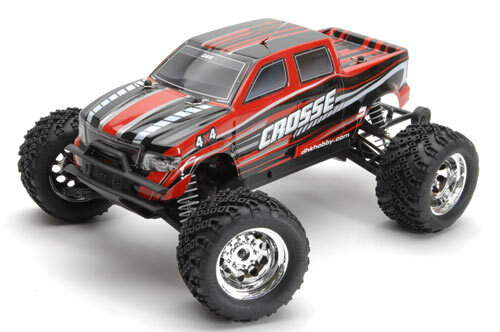 You will achieve awesome traction from a suspension and transmission that include over-sized threaded shocks, universal drive axles, adjustable turnbuckles, adjustable differentials and many other features normally found on only the more expensive trucks. 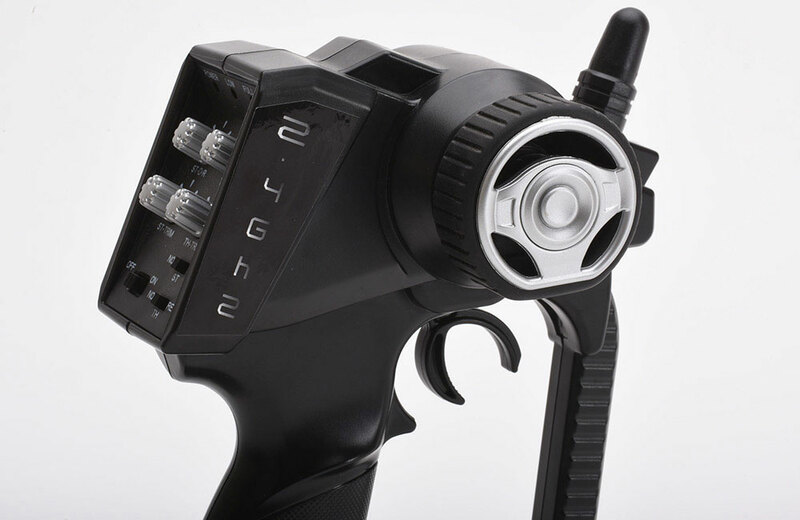 All of these features really put you in the driver's seat as you have the ability to tune and customize your Hunter to your driving style and preferences. 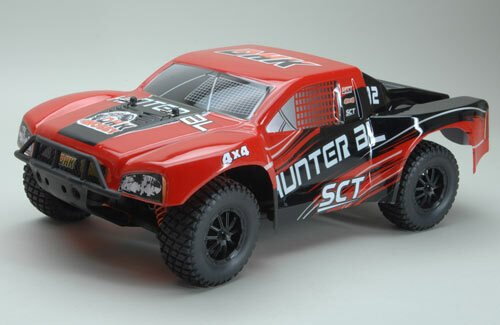 The DHK Hunter really is a complete package that's ready to run with battery, charger, and a high-performance 2.4Ghz radio system fully installed, just add 4x 'AA' batteries for your controller. 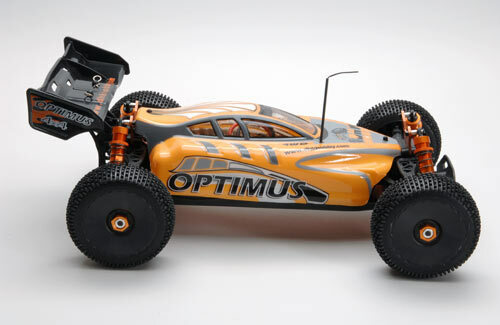 Serious nitro, competition performance without the mess and noise, that's what the Optimus XL is all about! What's more, it's just about ready to run out of the box. 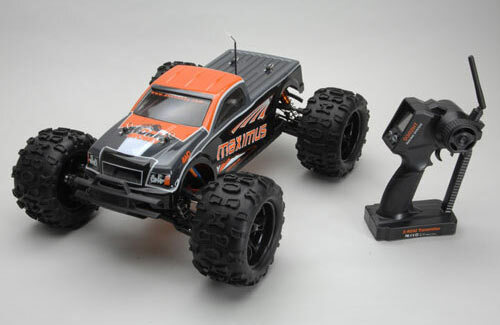 All you need to add is a charger and some transmitter batteries. 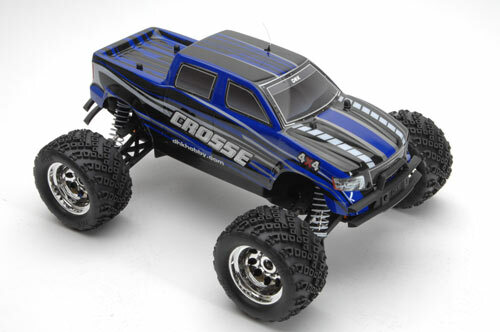 The word 'Ballistic' hardly seems adequate where the Optimus XL is concerned. The power available requires you to refine your throttle control and treat her with respect. Be prepared to re-calibrate your brain for a whole new level of performance. 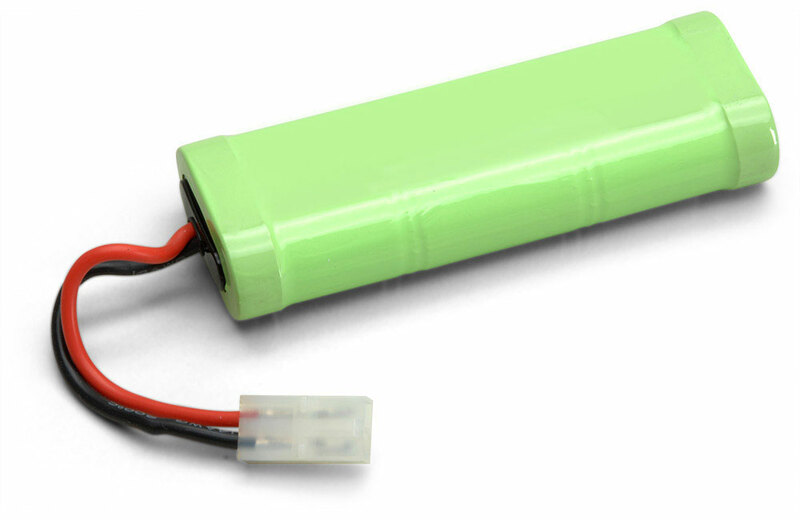 The high power, brushless, inrunner motor coupled to a durable 80A, fan-cooled ESC extracts maximum performance and fun from the included 2 x 2S cell 2600mAh Li-Po batteris wired into 4S. 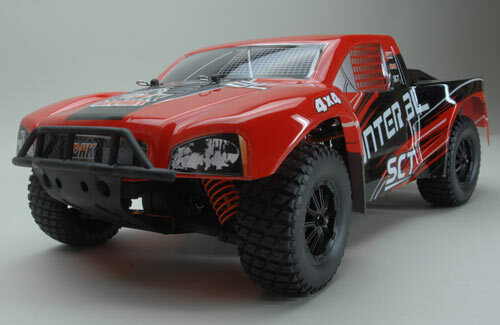 Enough to give event the most serious .21 nitro engine a run for it's money! Keeping the motor cool is handled by the fully-finned, CNC-machined motor mount. An optional fan is also available if you operate on really hot days. But power isn't everything. You need to transmit that power into the ground and this is where the Optimus scores yet again. You have 4WD through 3 differentials, metal gears in the differentials and metal drive shafts. 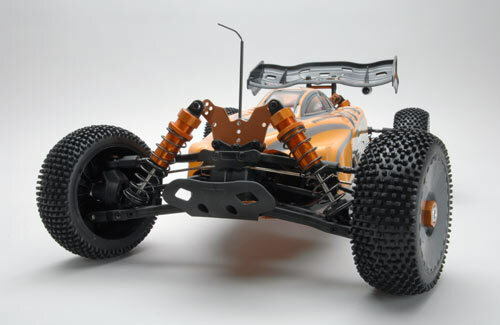 The front hub carriers are aluminium for low unsprung weight and durability.Needless tio say, everything is fully ballraced for long life and minimum power loss. 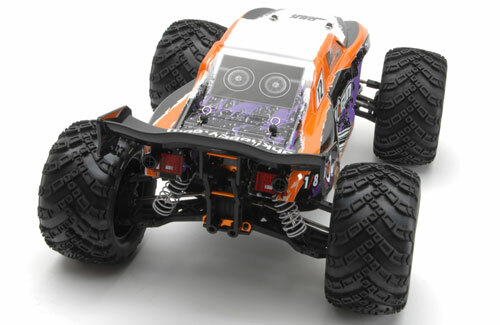 Grip is transmitted via full-dish wheels and mini-spike tyres. A tread pattern that works well on grass and dirt alike. The wheel style is both strong and practical. By shielding the hubs, dirt is kept away from the universal joints and bearings. The anodised, T6 3mm aluminium chassis has all the screws recessed to limit damage to the heads and the side protection plates for the radio are moulded in tough plastic to resist knocks over and over. 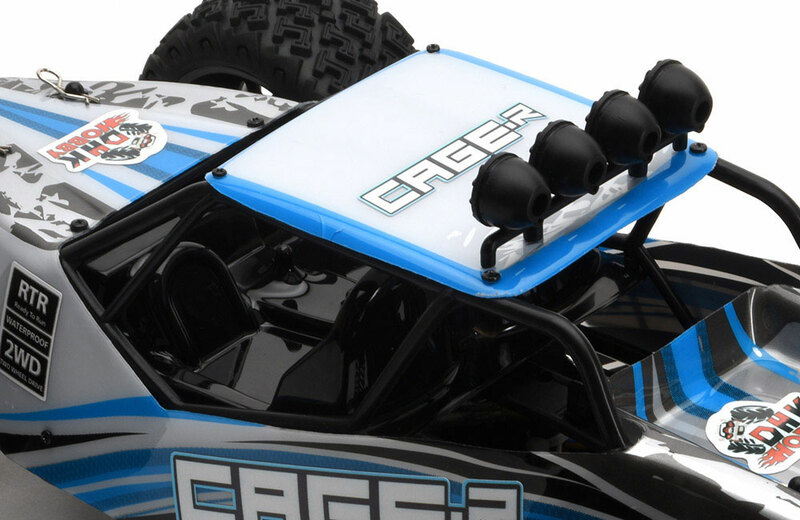 The top spine again uses anodised aluminium and creates a really strong structure to resist bending in jumps and rough off-road driving. 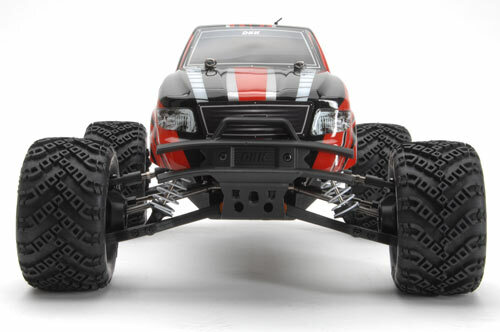 Suspension is courtesy of snazzy, anodised, 16mm, oil-filled, metal shocks plus anti-roll bars both front and rear. 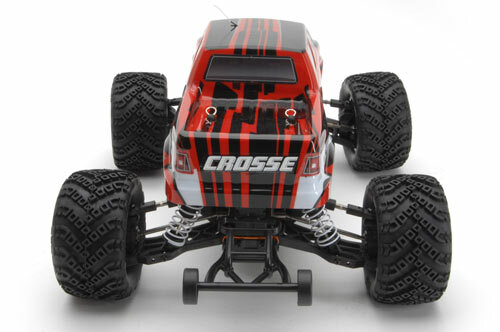 Camber and toe-in can be adjusted on the front and camber only on the back. Shocks mount on the tough, anodised, aluminium shock towers and have optional mounting positions top and bottom. The aerodynamic rear spoiler is moulded in super-strong, flexible plastic to absorb those 'roll-overs' and come back for more. The same is true for the front bumper. Even the body has good impact resisitance, thanks to the flexible, clear plastic chosen. 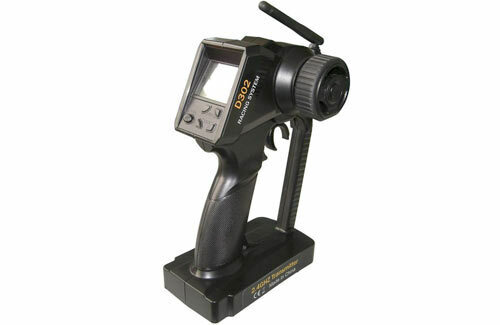 The radio is a fully computerised, 2.4GHz FHSS system. The transmitter has a full LCD display for programming. A really unusual standard feature for a car of this class. 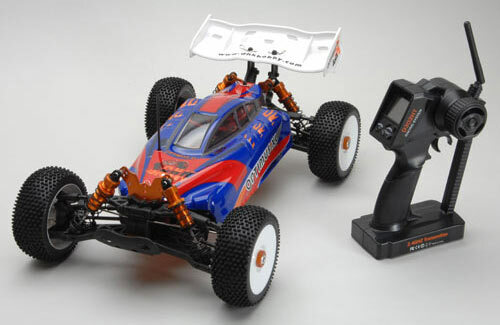 The steering servo offers 9Kg/cm of torque through metal gears and ballraces. Just about as tough as it comes!! 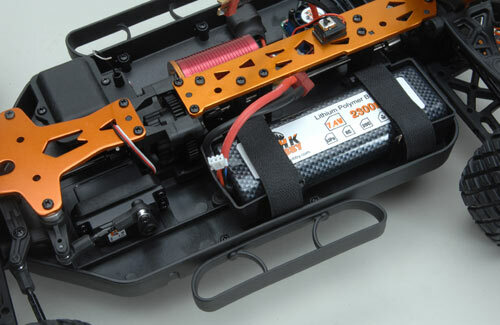 Of course, there's a servo saver in the steering to absorb those unexpected shocks to the servo as well. 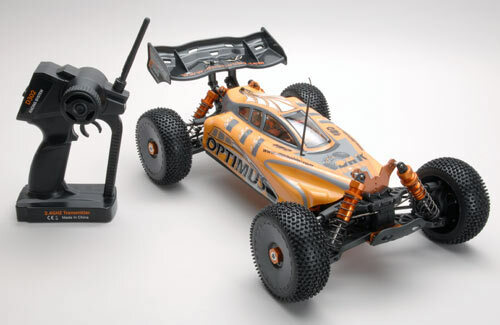 No charger is included but Ripmax recommends the Sigma EQ Mini as a good choice. All you need beyond that are 8 AA size transmitter batteries. They can be Nimh re-chargeable or dry cell type. If you use Nimh cells, you will need to obtain a suitable charger for them, although the Sigma EQ Mini can do that as well. Serious nitro, competition performance and 'Truck' aggression without the mess and noise, that's what the Maximus is all about! What's more, it's just about ready to run out of the box. 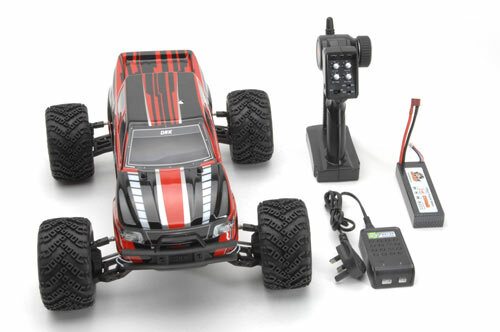 All you need to add is a charger and some transmitter batteries. Beware! 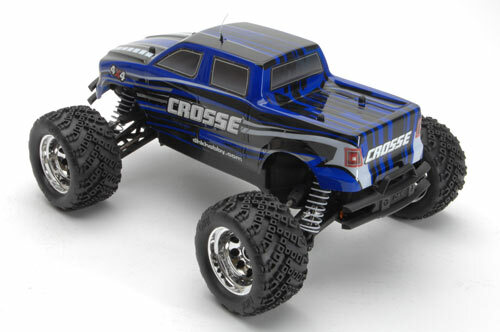 This truck is seriously fast and can cover ground much faster than you may think. You will need to hone your driving skills to master the Maximus! 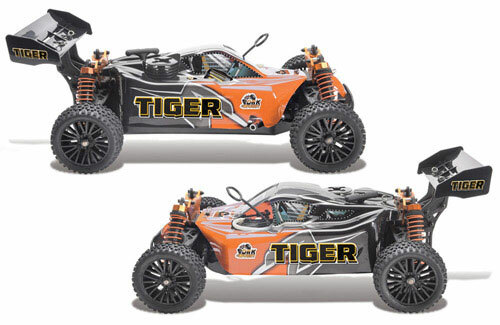 The high power, brushless, inrunner motor coupled to a durable 80A, fan-cooled ESC extracts maximum performance and fun from the included 2 x 2S cell 3200mAh Li-Po batteries wired into 4S. Enough to give event the most serious .21 nitro engine a run for it's money! Keeping the motor cool is handled by the fully-finned, CNC-machined motor mount. The Maximus even has an electric fan to keep the motor cool, usually an option part on many cars. But power isn't everything. You need to transmit that power into the ground and this is where the Maximus scores yet again. 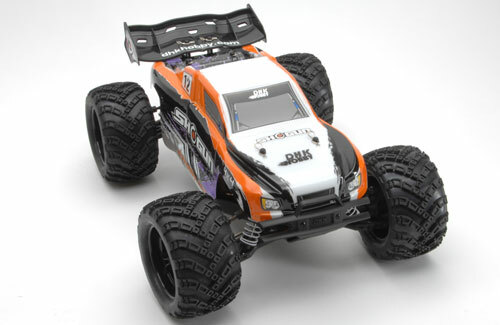 You have 4WD through 3 differentials, metal gears in the differentials and metal drive shafts. 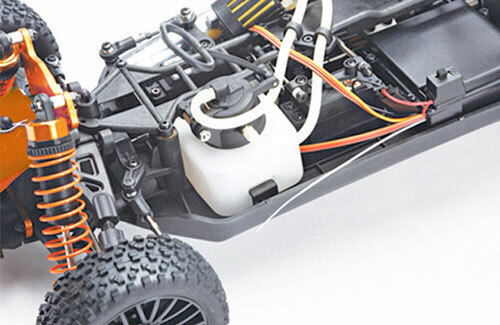 The front hub carriers are aluminium for low unsprung weight and durability.Needless tio say, everything is fully ballraced for long life and minimum power loss. 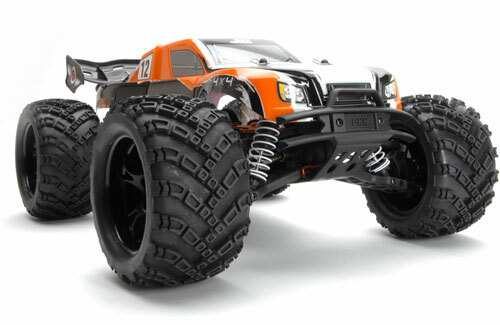 Grip is transmitted via large, tough wheels and chunky, all-terrain tyres. 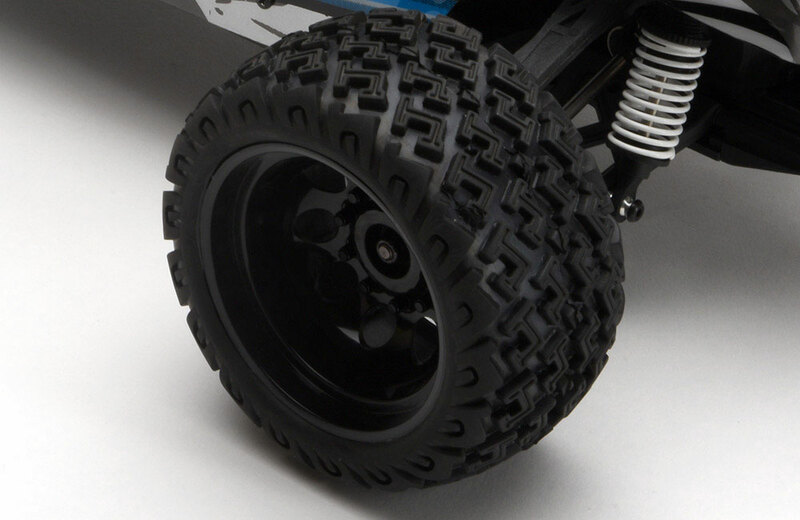 A tread pattern that works copes with just about any off-road surface. Recommended chargers are the Sigma EQ Mini and Sigma EQ Eco plus a 'Twins' adaptor, so that you can charge both batteries at the same time. 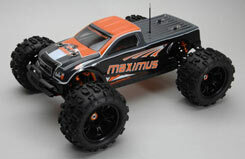 A range of heavy-duty upgrade parts are available to really customise your Maximus. 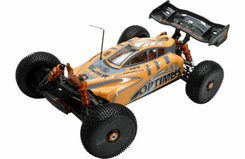 Nitro performance without the mess and noise, that's what the Optimus is all about! What's more, it's just about ready to run out of the box. 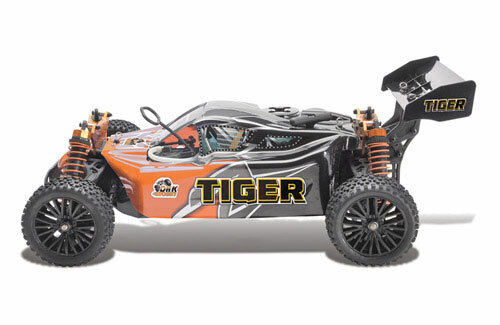 The high power, brushless, inrunner motor coupled to a durable 60A, fan-cooled ESC extracts maximum performance and fun from the included 3 cell 2600mAh Li-Po battery. Enough to give all but the most serious .21 nitro engine a run for its money! Keeping the motor cool is handled by the fully-finned, CNC-machined motor mount. An optional fan is also available if you operate on really hot days. You need to transmit that power into the ground and this is where the Optimus scores yet again. 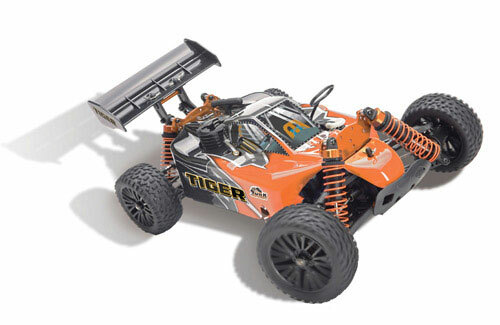 You have 4WD through 3 differentials, metal gears in the differentials and metal drive shafts. 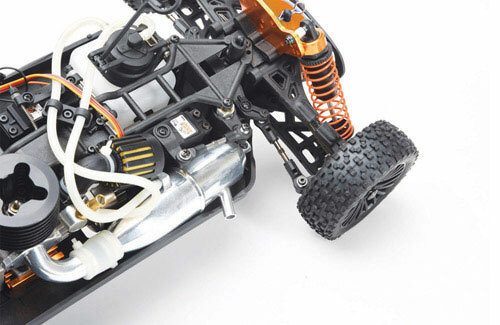 The front hub carriers are aluminium for low unsprung weight and durability.Needless tio say, everything is fully ballraced for long life and minimum power loss. 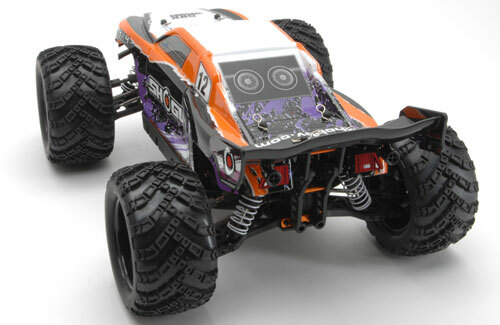 Grip is transmitted via full-dish wheels and mini-spike tyres. A tread pattern that works well on grass and dirt alike. The wheel style is both strong and practical. By shielding the hubs, dirt is kept away from the universal joints and bearings. 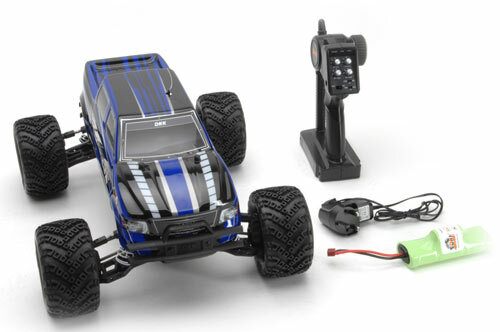 Included as standard is 240v AC, balance charger that can deliver 1A of charging. Again, a rare feature in a car at this price level. 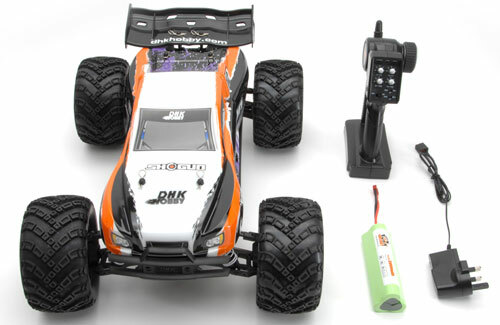 All you need extra are 8 AA size transmitter batteries. They can be Nimh re-chargeable or dry cell type. If you use Nimh cells, you will need to obtain a suitable charger for them. With all this high spec. gear, you want style as well. The Optimus delivers! 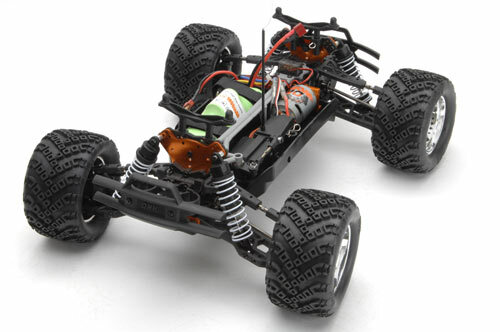 The body is modern and practical and the colour co-ordination extends from it to the metal parts of the chassis. 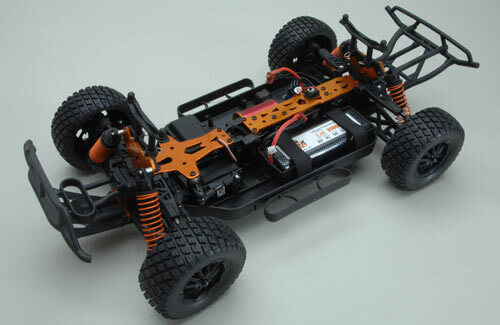 If you are looking for a serious 1/8th electric buggy, with serious performance and spec. but would rather not break the bank, the DHK Optimus is the only logical choice. 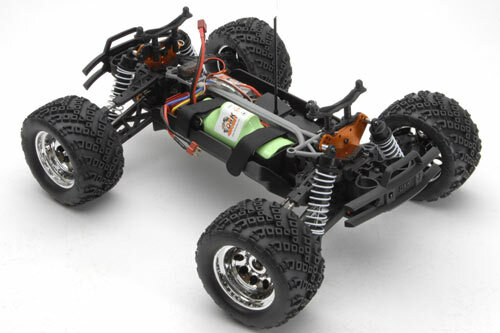 Serious nitro, competition performance and 'Truggy' style without the mess and noise, that's what the Zombie is all about! What's more, it's just about ready to run out of the box. 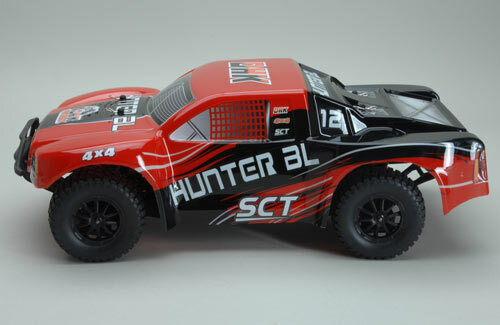 All you need to add are some transmitter batteries. The one thing that the Zombie does different is to make a statement. That statement is 'Fun'! 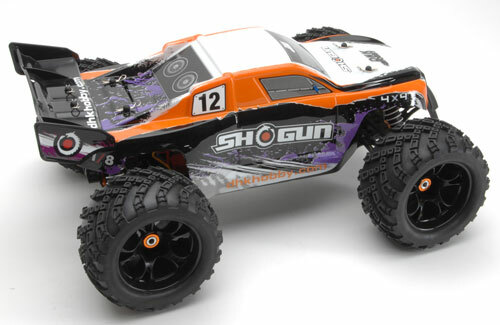 Not only do you get all-terrain performance, you get a 'wicked' colour scheme and body as well. In all respects, the Zombie is not for the feint hearted. 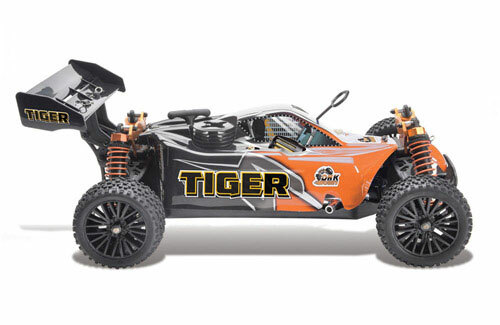 The high power, brushless, inrunner motor coupled to a durable 80A, fan-cooled ESC extracting maximum performancse and fun from the included 3S cell 2600mAh Li-Po battery. Enough to give many .21 nitro engine a run for their money. 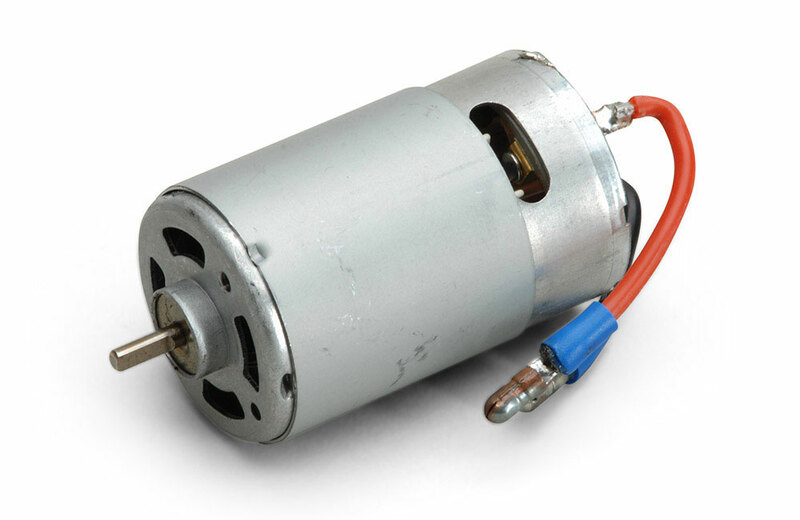 The motor is kept cool by a finned, CNC machined mount that you can fit an optional fan to if required. But power isn't everything. You need to transmit that power into the ground and this is where the Zombie comes into its own. 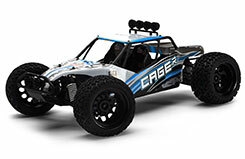 You have 4WD through 3 differentials, metal gears in the differentials and metal drive shafts. 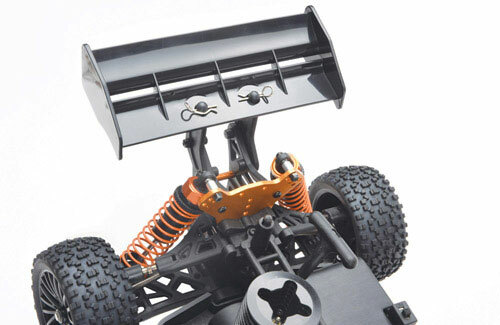 The front hub carriers are aluminium for low unsprung weight and durability.Needless tio say, everything is fully ballraced for long life and minimum power loss. 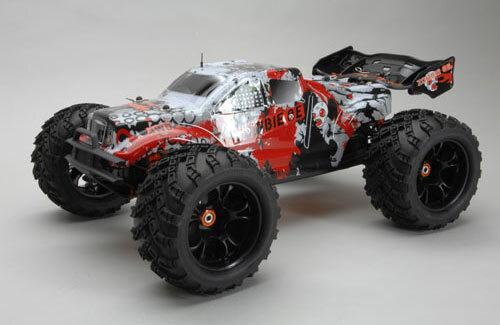 Grip is transmitted via large, tough wheels and chunky, all-terrain tyres, with a high-speed 'V' pattern. A tread pattern that works copes with just about any off-road surface but especially loose ones. A range of heavy-duty upgrade parts are available to really customise your Zombie. 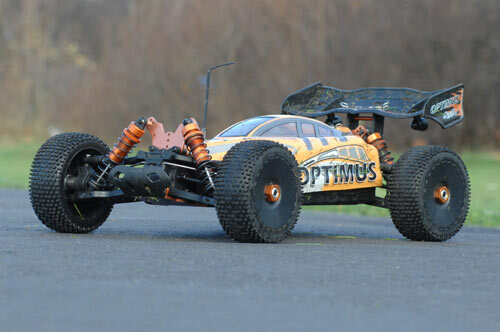 So you want a model which is supplied Ready-to-Run, has 4 wheel drive, large wheels and soft compound tyres, big bore suspension to soak up everything you can throw at it and a rear wing that isn�t just for show? Enter the Shogun - DHK�s most aggressive off-road 1/8 scale vehicle yet! 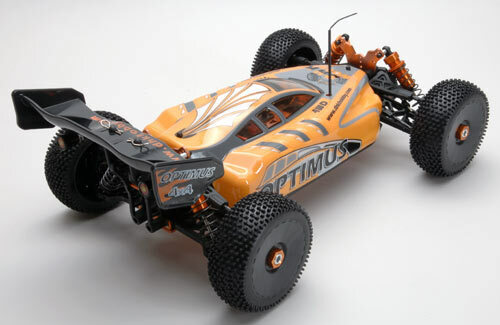 Transmitting the brushed power through all four wheels comes courtesy of 3 differentials, held securely in place by the rigid anodized orange chassis top decks. Think brushed and you�d be forgiven for thinking 540; not so here! 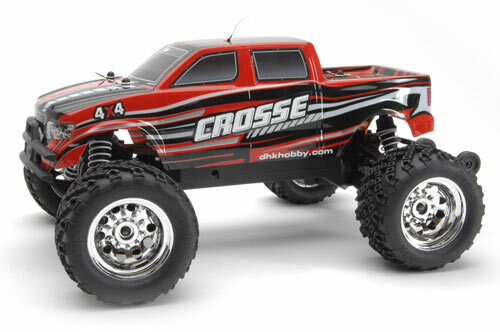 The huge 775 class brushed motor is regulated by the 55A ESC which is connected to the pre-installed 2.4GHz receiver while the pistol grip transmitter offers dual rates and EPA! As with the motor, once again, DHK have �brushed� convention aside - the included battery pack is a humped 10.8v affair rather than the mainstream 7.2v for plenty more punch! For those whose appettite is left unsatisfied by this, an 11.1v Li-Po pack is available as an option! Give your local park both barrels with the DHK Shogun! 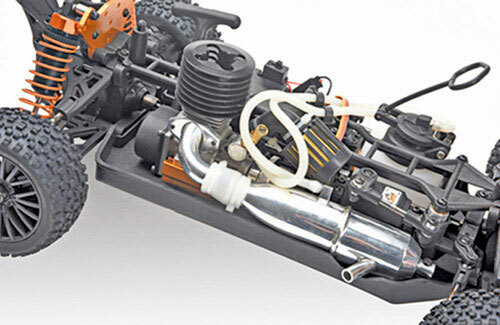 At the heart of the Tiger is a tough, ball-raced, .15 class ABC engine with a durable pull-start system. It�s power is further boosted by an optimised yet quiet, tuned-pipe system. 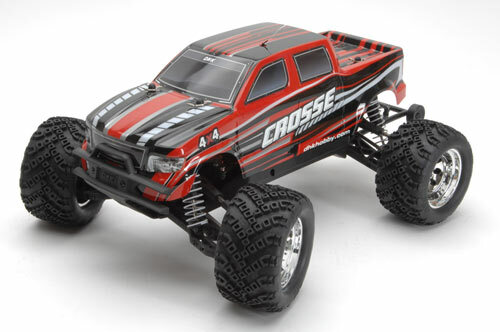 The chassis is moulded from a tough plastic and rigidity is enhanced by the use of a top spine to link the upper sections of the transmission gearboxes.